Printing on transparent media is made possible by the application of white ink as an under or over layer. Proofing while printing LED backlights illuminate printed media just after printing, reproducing a backlit signage application and ensuring immediate quality inspection. A key feature of UV-curable ink is the thickness of the ink layer on the media, which enables much greater ‘blockout’ performance than other print methods. This is particularly beneficial in backlit signage applications where the ability to block out backlighting in certain areas improves overall illuminated colour performance and vibrancy. 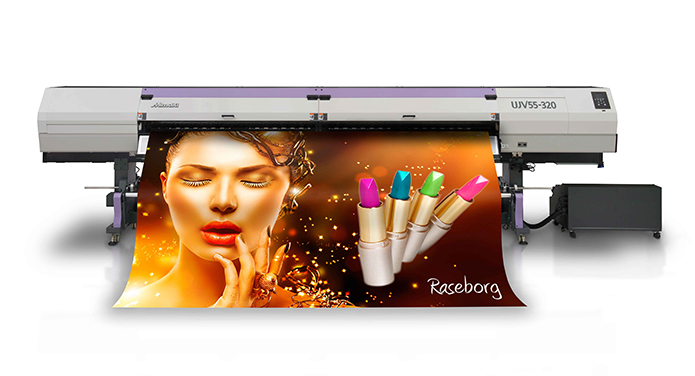 The UJV55-320 is equipped with Mimaki’s original automatic NCU. Clogged nozzles are automatically detected and cleaned by the NCU. If the clogging is not resolved by cleaning, the UJV55-320 automatically sets the nozzle recovery function NRS and resumes printing. These functions significantly reduce the waste printing caused by clogged nozzles during a continuous printing run. The NRS substitutes defective nozzles with non-defective nozzles until the technician arrives. This feature enables uninterrupted print operations and continuous productivity. Head configuration: Four print heads in a staggered array. 1 head: 1,280 nozzles (320 nozzles X 4 lines), Y C M K 4 heads: total 5,120 nozzles. Packaging 1 litre ink bottle, Ink can be filled up to 3 litres per ink colour. Roll outer diameter Large drive shafts: Φ250mm or less. Small drive shaft with roll holders: Φ180mm or less. Roll weight Large drive shafts: 100kg or less. Power supply AC 200 – 240V ± 10% 50/60 Hz ± 1 Hz, 18 A or less.